Those porgs look as adorable as they look delicious. But what inspired them? The Jedi have been revered through history for their ancient wisdom, paramilitary prowess, and calm demeanor in the face of danger. But The Last Jedi introduced a power that is seldom discussed and one that even the Jedi, for all of their mysticism, could never tap into. That power is the the ability to be so stinking adorable that you manage to make a vegan out of the mighty Chewbacca. Who can resist that little face? But the creation of porgs was a stressful task. Although most of the creatures to come from Star Wars are embraced by fans, some have gone down in infamy as the most hated creatures in geek-culture. For proof, look no further than The Phantom Menace's Jar Jar Binks. 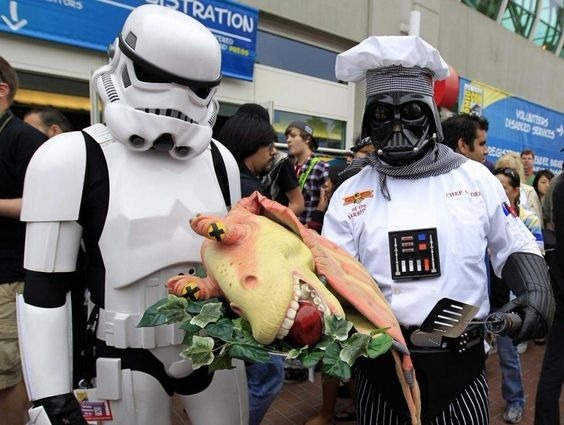 No love for Jar Jar at this convention. Neal Scanlan was a creature effects supervisor on the film. He described it like this: "Doing the porgs actually was terrifying, because you have a fear that if you get it wrong all the fans are going to sort of hate you forever quite rightly... as soon as we heard there was a warm reaction to them, it's great." Though many fans were originally nervous that the porgs would compromise the overall tone of the film, their reception turned out to be mostly positive. Most viewers felt that they were balanced well throughout the movie. But have you wondered what inspired them? Skellig Michael is an island off the coast of Ireland, which served as a primary film location. The island is a wildlife preserve, housing hundreds of puffins. Director Rian Johnson described Skellig Michael as a place where it's very difficult to avoid stepping on a puffin, and they were not allowed to mess with them while filming. Concept Designer Jake Lunt Davies stated: "That island is covered in puffins. It’s a wildlife preserve and everywhere you look there are hundreds of birds dotted around the landscape. From what I gathered, Rian, in a positive spin on this, was looking at how can he work with this. You can’t remove them. You physically can’t get rid of them. And digitally removing them is an issue and a lot of work, so let’s just roll with it, play with it." Johnson requested "puffin people" to be indigenous to the fictional island, and so the puffins were transformed into Star Wars-ish creatures with eyes so big that they gave my grandma's pug a run for the money. Whether you loved The Last Jedi or felt that The Last Jedi should be purged from existence, I think we can all agree on one thing...those adorable porgs could make for a delicious family barbecue. What do you think porg would taste like...or would you rather keep one as a pet? For more geek mythology visit www.screenplayas.com.